The only networking problem at pCTF 2011 was unusual because it involved ZigBee, based on IEEE 802.15.4. We captured this network traffic from outside of an AED employee's home. Decrypt it and find the key. Update: Our operatives were able to decrypt packet #18 in the capture file. 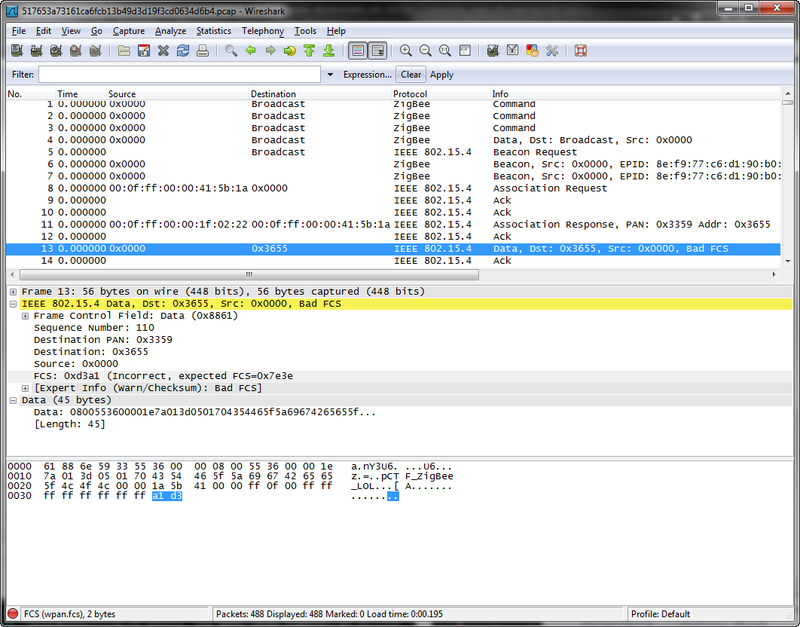 Wireshark recognizes IEEE 802.15.4 and ZigBee. At packet #13 you see "pCTF_ZigBee_LOL" (15 bytes) while the following data packets are recognized as encrypted. After a few reads on ZigBee you find that the communication is encrypted using AES-CTR with a network key of 16 bytes that has been sent in clear, at packet 13. 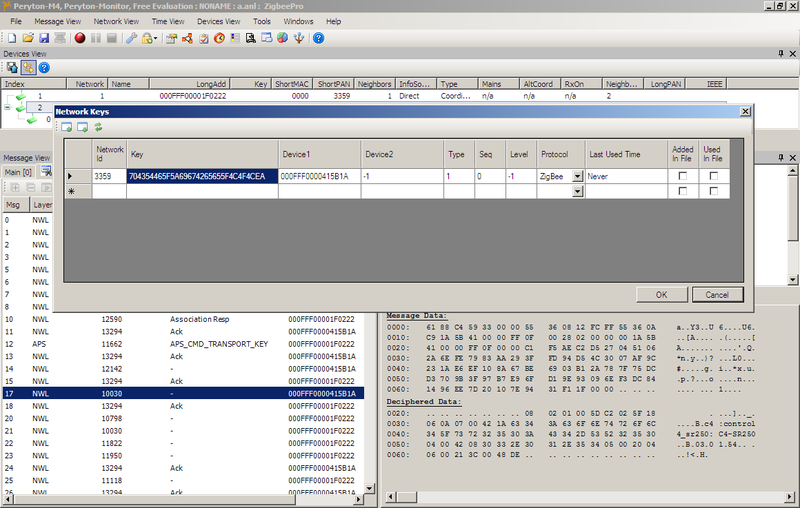 Still in Wireshark, you see that the Frame Check Sequence (FCS) of packet #13 is incorrect. As explained in the context, some bytes have flipped, much likely the last byte of the key (\x00). Let's recover this missing byte by trying all possibilities and calculating the FCS of the new frame to get the expected one (0xd3a1). According to the documentation, FCS is CRC-16-CCITT (reversed polynom 0x8408). I first tried to decrypt ZigBee packets implementing their AES-CTR encryption (see this good presentation), but it was painful. Let's just find if a ZigBee analysis tool already exists. And there is one! I found Perytons and they even provide a free evaluation (direct .exe link). You read: "Key : z1gb33_r0ck5"
Thanks tylerni7 for this unusual challenge! You will see a new tab at the bottom showing the decrypted data. One quick question, how could you know that this particular string "pCTF_ZigBee_LOL" in the data payload (of 804.15.4) is the network key of the network layer? does zigbee specify that? ZigBee surely specifies that, as Perytons is able to automatically read the ZigBee Network Key and decrypt the next packets with it. 2) it looked like a good place: it's the only data packet marked as "not encrypted" while the next ones are marked as "encrypted"
3) it looks like a key :) ascii printable + "pCTF" + "ZigBee"